There have been a number of films made about King Kong; one of the most recent is the 2005 Peter Jackson film that had a cast full of stars. 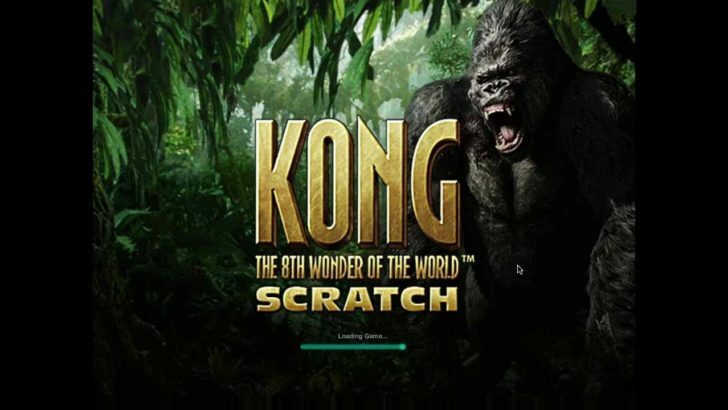 Now these characters, and Kong himself, can be enjoyed in an exciting scratch card from which you could win some huge payouts. The game play is very simple. First, you need to decide how much you want to spend on a scratch card. Then just click on ‘Play’ to activate your card. You can then reveal the prize symbol and amount, and then scratch away the six panels one at a time to see if you have a matching symbol. If you do, then you have won. The cards give you the chance to win up to 10,000 times the cost of the card, so if you spend just 10p you could win £1,000! The symbols include Kong, various characters from the film, dinosaurs, the game’s logo, and more. They don’t have fixed values, rather a random prize amount is assigned to each card. As a result, there is no hierarchy of symbols; they can all land you huge wins. Some people will enjoy peeling back the symbols one at a time to see if they have won while others will want a faster paced experience. You have the choice between clicking on the symbols one at a time to reveal them, or you can just click on ‘Scratch All’ to reveal everything at once. The game even has an ‘Autoplay’ function. You can choose how many cards you want to play, then click on the play button and sit back and watch the cards reveal themselves and the wins come in. People often dismiss scratch cards as simple games, but in fact, they can provide you with hours of entertainment and masses of winnings. Furthermore, they are a very relaxing way to have fun, as you do not need to worry about complicated strategies. Join Kong the 8th Wonder of the World today and see what prizes he is hiding for you.